Georgia developers propose 272 apartments, but plans lacking retail in vital Nulu–Butchertown corridor. This past April, Broken Sidewalk broke the news that the much-watched Service Tanks Property at 700 East Main Street had been placed under contract. Now Jacob Ryan at WFPL brings the first news of what’s slated to that 2.72-acre site. Georgia-based Flournoy Companies held a neighborhood meeting Tuesday night at The Green Building, where a couple teaser renderings and a site plan were unveiled, and Ryan reported today on the company’s early development plans. Flournoy vice presidents Blake Breimann and Ryan Foster were on hand at the event. Calls to Flournoy today were not returned by press time. Plans include 272 units of residential apartments in a five-story building and a five-story, 430-space parking garage. What wasn’t proposed is just as revealing: no retail is planned at the site, and developers plan to clear the entire site north of Billy Goat Strut alley, which includes a three-story, historic corner commercial building. Apartments, ranging from studios to two-bedroom units, will top out at around $2,200 a month, according to Ryan’s report. The project site plan also notes that 7,000 square of amenity space is planned including a fitness center, clubroom, and tenant swimming pool. Developers estimated the project could be complete in about 2 years, Ryan noted. The site plan shows the building wrapping a large parking garage on roughly the eastern half of the site. On the western half, a square doughnut forms a courtyard with a tenant swimming pool. 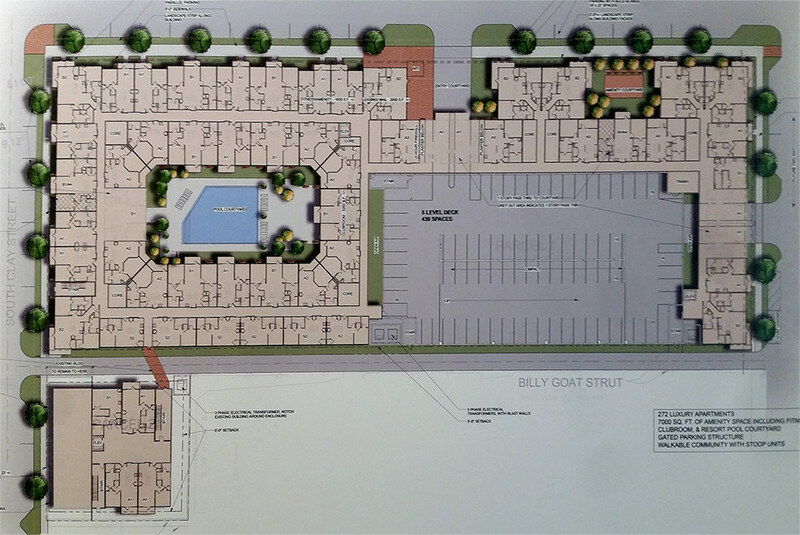 The site plan arrangement is in line with nearby developments by Columbus, Ohio developer Edwards Companies in the Original Highlands and Phoenix Hill. 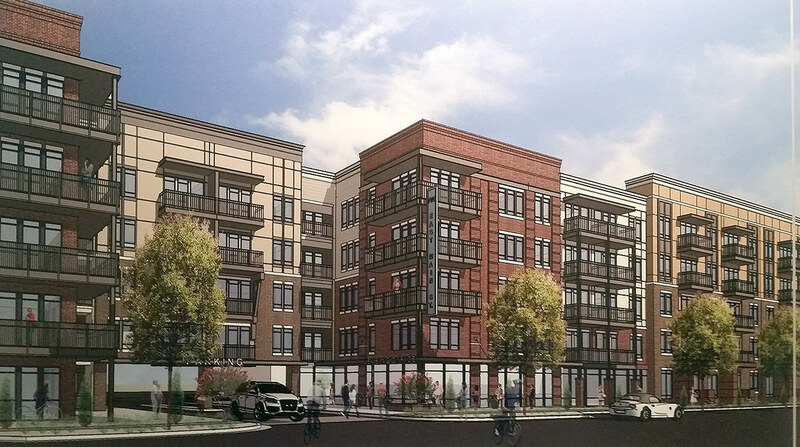 According to a rendering presented at The Green Building, the apartment building appears to be clad in several colors of brick, either rising to the structure’s full five-story height at corners or the first three stories elsewhere with what look like fiber cement panels covering the upper two floors. A subtle, almost flat, cornice line is shown at the top of the structure. Ample use of balconies is also shown, a welcome sign on any new residential project, creating dynamic patterns on upper floors. A leasing gallery is shown next to the entrance to the parking garage. The general form along Main Street is a protruding and withdrawing mass that creates small landscaped areas along the street. 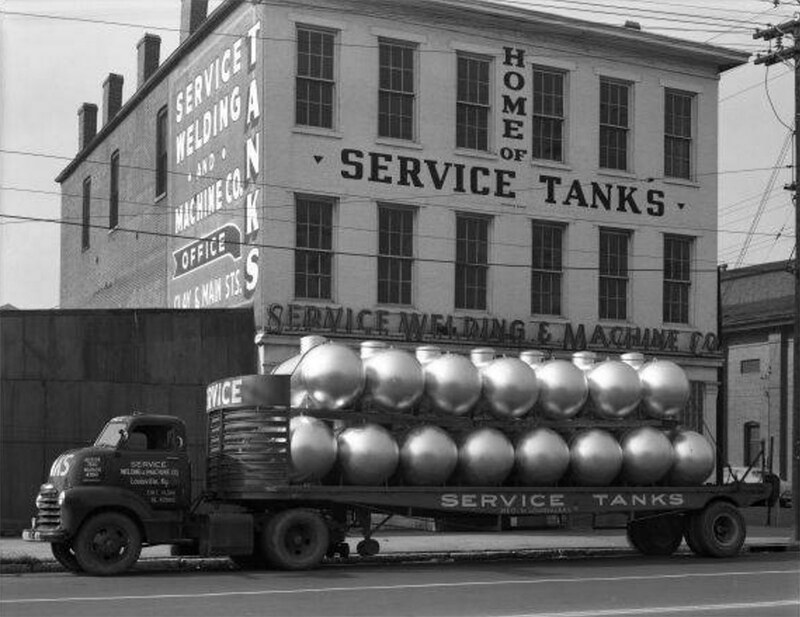 The Service Tanks site runs along East Main Street from Shelby Street to Clay Street, wrapping around the side streets at least until Billy Goat Strut alley, and along Clay another 100 feet. Overall, the site covers 1,050 linear feet of street frontage, about the size of two Louisville blocks. To go without retail frontage on such a large extent of frontage, especially along Main Street, would certainly hinder the pedestrian vitality growing along Nulu’s East Market Street main drag. 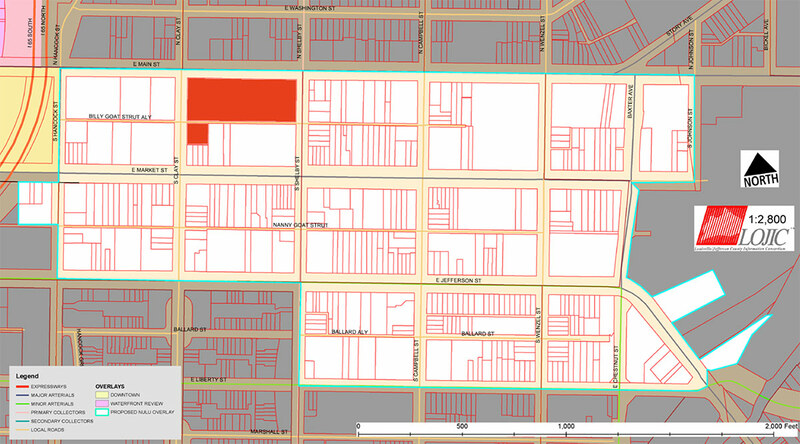 Nulu can’t thrive as a few blocks of retail located along one linear street. By not pulling retail along side streets to Main, the 700 East Main project serves to disconnect the area with momentum taking shape in Butchertown. That’s a concern shared by many in the neighborhood. But according to Gill Holland, Flournoy Companies has been willing to listen to neighborhood concerns. Holland briefly attended last night’s meeting and met with developers six weeks ago at another neighborhood meeting. Adding retail wouldn’t only help the Nulu and Butchertown neighborhoods, it could also help developers make it through the public review process more easily. The 700 East Main site falls under the newly created Nulu Review Overlay District (NROD). Formed in 2015, the overlay’s first big test was approving the Rabbit Hole Distillery a block south, but Flournoy’s project will be next up to move through the committee. Let’s look at a couple NROD guidelines the committee use to evaluate the 700 East Main proposal. The new building does create an urban edge along Main Street, but more along the lines of the AMP Apartments on Frankfort Avenue by Indianapolis-based Milhaus development, which set the building back slightly behind grass and offered no retail. Flournoy wrote on its site plan that the building featured “stoop” units, but such ground level apartments along major arterials in Louisville like Main typically lend an alienating feel to a project. 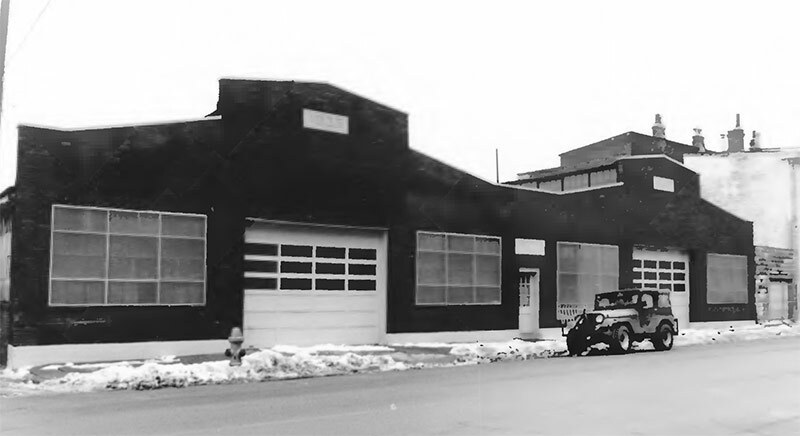 Additionally, the site sits directly across the street from the Butchertown Landmarks Preservation District and within the Phoenix Hill National Register Historic District. According to the Kentucky Archaeological Survey, a three-story brick corner structure was built between 1875 and 1899 and is listed as historically contributing. Around the corner on Clay Street south of Billy Goat Strut, a smaller outlying parcel contains a one-story building built first in 1925 and expanded in 1936. Developers plan on keeping the front part of this structure, likely because of the complexities building on its parcel would add to the project. Plans show demolition of the back two-thirds of the structure for four apartments. That third of building up front shows undefined space. But the corner commercial building at Main and Clay streets right now is slated for demolition. Given that the historic corner building occupies a small portion of the site, which is essentially a large blank canvas, it seems unlikely that the latter two situations above would apply. 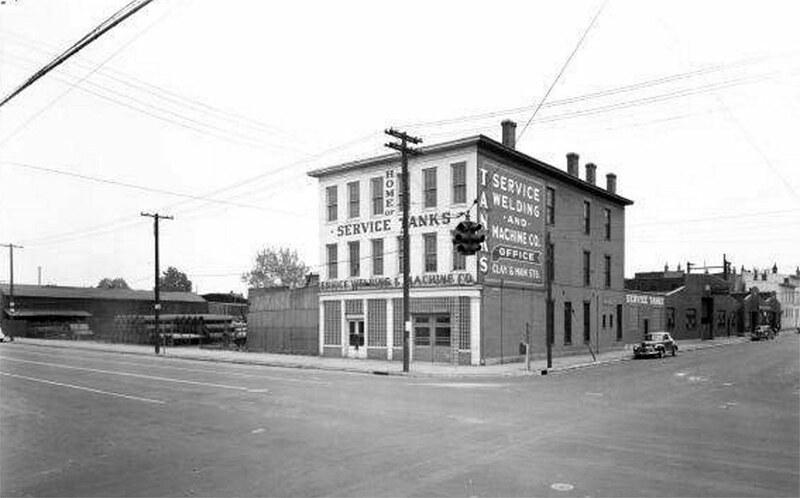 But the more dubious notion that a historic building could be torn down on economic vitality concerns puts all historic structures in Louisville at risk. Given the undulating site plan, it seems like a simple design compromise could easily solve this problem. Flournoy Companies have a lot of projects completed in the southern United States, and a lot more in the works. Some of the new projects include the District West Apartments in Greenville, South Carolina; the Chroma Apartments on the outskirts of San Antonio, Texas; Eastside Station Apartments in Austin, Texas; and the 35 Folly Apartments on the edge of Charleston, South Carolina. That latter example, built on a largely vacant brownfield site next to Charleston’s iconic cable-stay bridge, even looks a little bit like a lower but larger version of the Louisville proposal. The 700 East Main Street project is just the latest in a string of high-profile development taking shape or planned in the area. Directly northwest of the 700 East Main site, Nashville-based Bristol Development Group is building the seven-story Main & Clay Apartments, containing another 270 luxury units, a parking garage, and a modicum of retail on a slightly smaller parcel. On the southeast corner of the 700 East Main block, Creation Gardens owner Ron Turnier are building an AC Hotel by Marriott, which is moving forward after laying quiet for several months. More on that soon. Creation Gardens had formerly proposed a wholesale grocery store for the site and worked with Service Tanks owners to put together a bold vision for the entire block. A block south, between Market and Jefferson streets, the Rabbit Hole Distillery is slowly moving along. As we mentioned, that project was the first to go through the NROD process, which slowed everything down slightly as committee members needed to be appointed. The distillery also recently received approval for state tax credits. 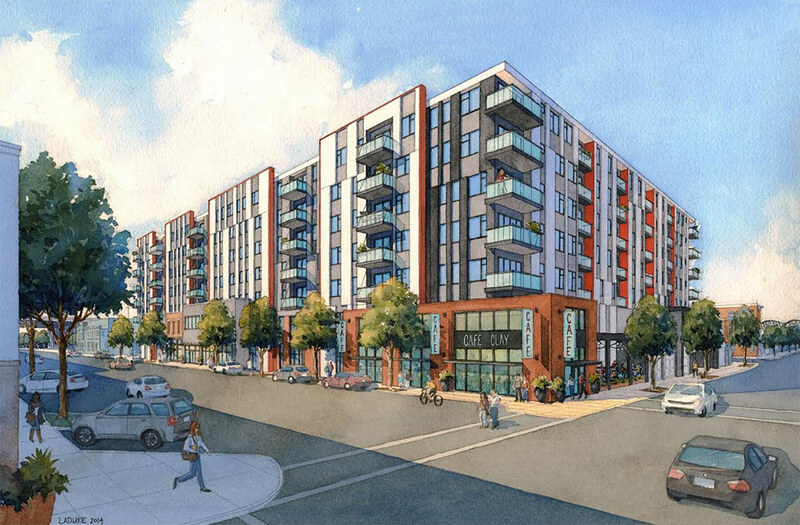 Not much farther away, City Properties Group wrapped up their 310@Nulu apartment project and is planning to redo the Louisville Chemical Building at Jefferson and Hancock streets into retail and residential space. Across Hancock, City Properties Group has also announced plans for another hotel. Tuesday’s meeting at The Green Building was still very preliminary and plans have yet to be submitted to Metro Louisville Planning & Design for review. Any waivers and variances developers seek will also be known then. 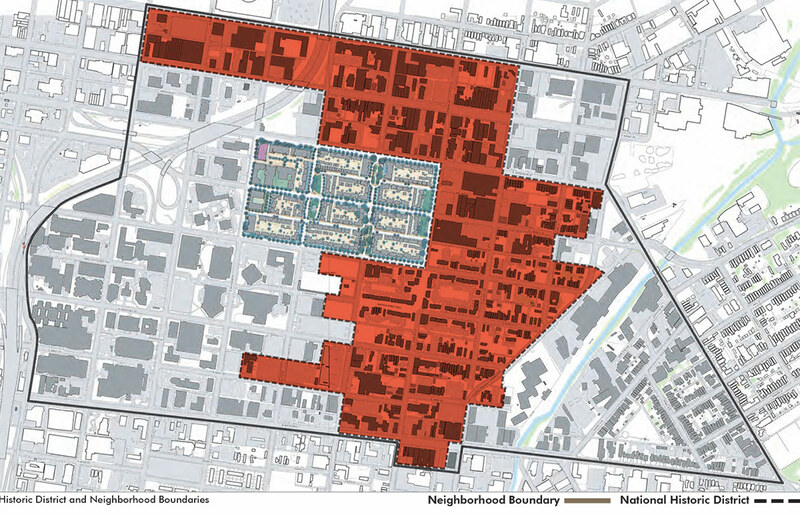 Once that happens, the project can begin moving through the public review process, which will include among others, the Nulu Review Overlay District, as mentioned above. Until plans firm up a little more, the project is still uncertain. The site still hasn’t closed, according to Tyler Smith of PRG, who has it listed for $8.9 million. Smith declined to comment on the project or the developer. It’s typical, however, for sites like this to remain under contract until necessary approvals are secured that allow construction to proceed. A developer doesn’t want to be left holding a property without a development to build on it. Still, despite the couple of issues we highlighted here with retail and preservation, the 700 East Main project looks off to a good start. And it’s heartening to hear developers at Flournoy are actively listening to and working with the neighborhood. The bones of the project look good and 700 East Main, with some retail and a historic corner anchor, would serve as a great addition to East Main Street, Nulu, and Butchertown. We’ll be excitedly watching to see how this project evolves as it moved along. Excellent maybe Gill Holland can get them to compromise on retail so we can get another 300 sq ft of retail just like Main and Clay, and between the two of them they will have enough space for one coffee shop. 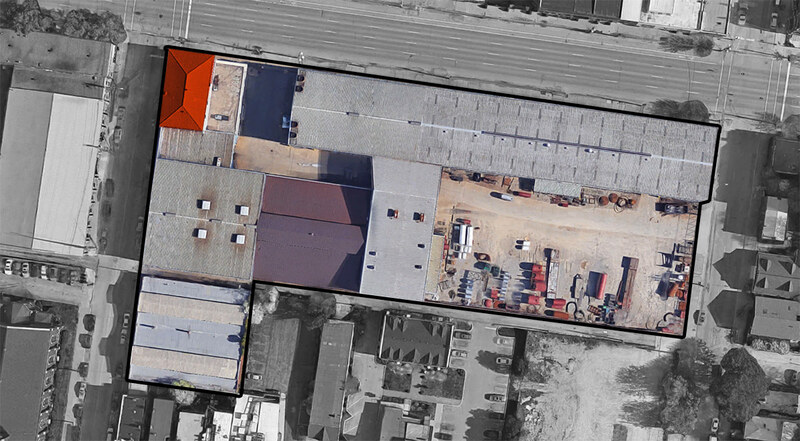 The historic, 3-story corner building has a 40′ x 70′ footprint, which is only 2% of the total site area. Its position in the extreme northwestern corner couldn’t be better in terms of site planning. And a 3-story building at the corner abutting a 5-story building would add visual interest to the block. C., You are dead on. Good point, C. It seems incorporating the historic structure would not be very hard and would help with the transition to the historic one-story building around the corner that they are already planning to keep. Also, is 1.58 parking ratio needed for this location? Wouldn’t the developer make more money if they create more rentable space vs parking? I grew up with “Urban Renewal” which unnecessarily wrecked downtown. After all these years, and unlike soooo many other cities, it seems that the city of Louisville still has no vision, plan or even interest in preserving our historic structures. So disappointing. Just tear it all down… What a waste.